The Grafton Common Art Gallery is about to close on December 15th! 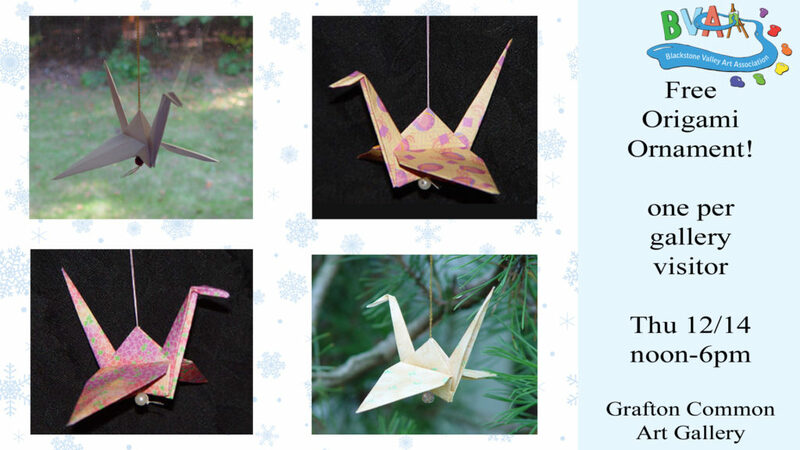 As a warm thank-you to all our visitors, every person who comes into the gallery on Thursday, December 14th will get a free origami ornament! Lisa Shea will be there from 3-6pm so if you come during those hours she can custom create one for you. If you come earlier 12-3 you can choose from the selection in the gallery. It’s the perfect time for that last minute holiday shopping! It’s the building with the AppleTree Arts in it! Note that the gallery is SHUTTING DOWN as of Friday, December 15th, 2017 – be sure to come visit before then!